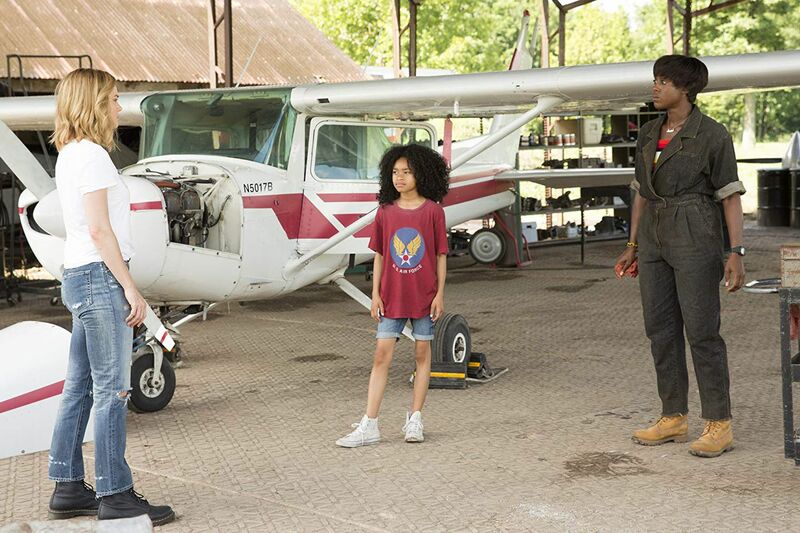 A still of Monica Rambeau from Captain Marvel. This post contains spoilers regarding the plot of Captain Marvel. When Carol Danvers, a.k.a. Captain Marvel, returns to Earth in next month’s Avengers: Endgame, she’ll be coming back to a different world, in part because it’ll be 23 years older than when she left it in 1995. The pager she amps up in the movie Captain Marvel will look clunkily out of place. The internet will (thankfully) be much faster. She’ll no longer have to rely on CD-ROMs, pay phones, or maps to point her where she needs to go. But, most importantly, the people will be different too. Nick Fury will be gone (she finds out he’s missing in Captain Marvel’s post-credits scene). Maria Rambeau, Carol’s best friend, will be older (if she hasn’t been dusted by Thanos’s snap). 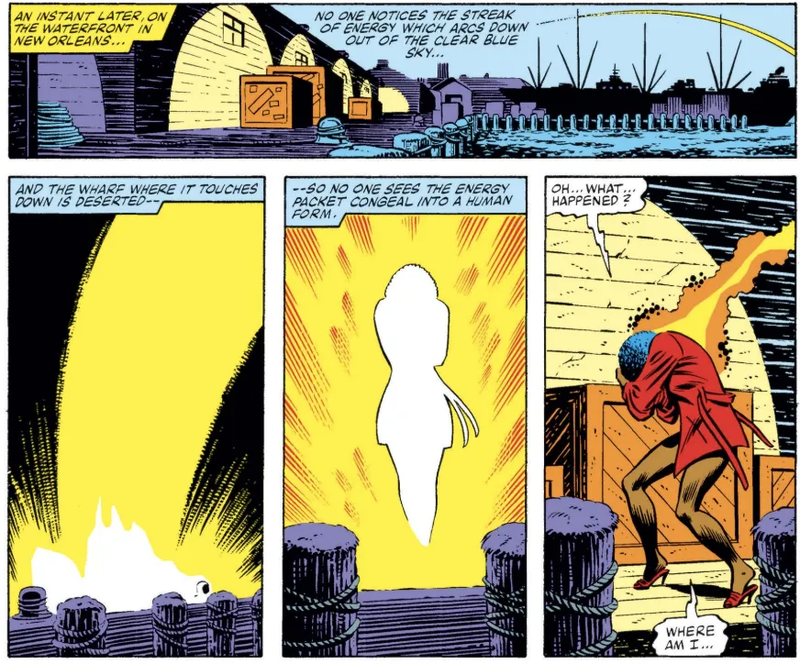 And Monica Rambeau, Carol’s adopted niece of sorts (in the film, Monica says that she and her mother were Carol’s family, because Carol had problems with her own family) will no longer be a precocious kid but a grown adult (again, if she survived the snap). What’s coming next in Monica Rambeau’s story is arguably the most intriguing tease in Captain Marvel. The movie, quickly and briefly, foreshadows Monica’s comic book origins as a superhero capable traveling at the speed of light. The stark difference between the comic books and the movie is that in Captain Marvel, Monica is still just a child — something Endgame’s 23-year time jump fixes easily. And her introduction could easily be Captain Marvel’s next story, because in the comic books, she too is known as Captain Marvel. In one of the film’s final scenes, after she saves the Earth from the Kree bombing raid, Carol has a conversation with the Rambeaus, Skrulls, and Fury about, among other things, how Monica wants to be like her superpowered, fearless “aunt” and go to space to help beings like the Skrulls. Fury tells Monica that maybe she will one day “learn to glow like Aunt Carol” — a huge wink to comic book fans. The “glow” Fury’s referring to is seen in the movie’s third act, when Carol accepts and harnesses her photon powers to become more powerful than she ever thought possible. But it’s curious that Fury is specifically referring to Carol’s “glow,” as opposed to her photon beams or superpowered punches; “glowing” is exactly what Monica does in the comic books, indicating that this might be a deliberate choice of words that reference Monica’s comic book life. In the comic books, Monica is a grown woman who has existed as a superhero since her first appearance in 1982’s Amazing Spider-Man Annual No. 16, written by Roger Stern and drawn by John Romita Jr.
Monica Rambeau in Amazing Spider-Man Annual No. 16. 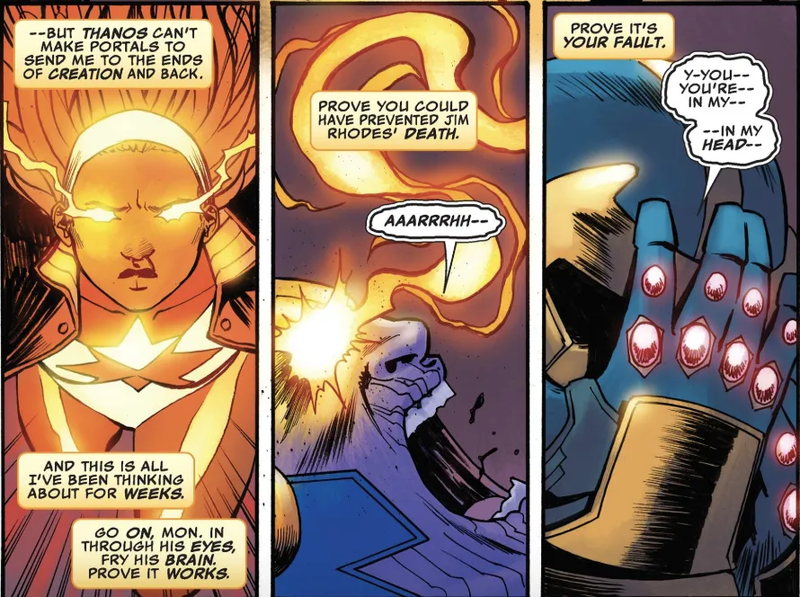 Monica using her powers in Mighty Avengers No. 1 (2013). 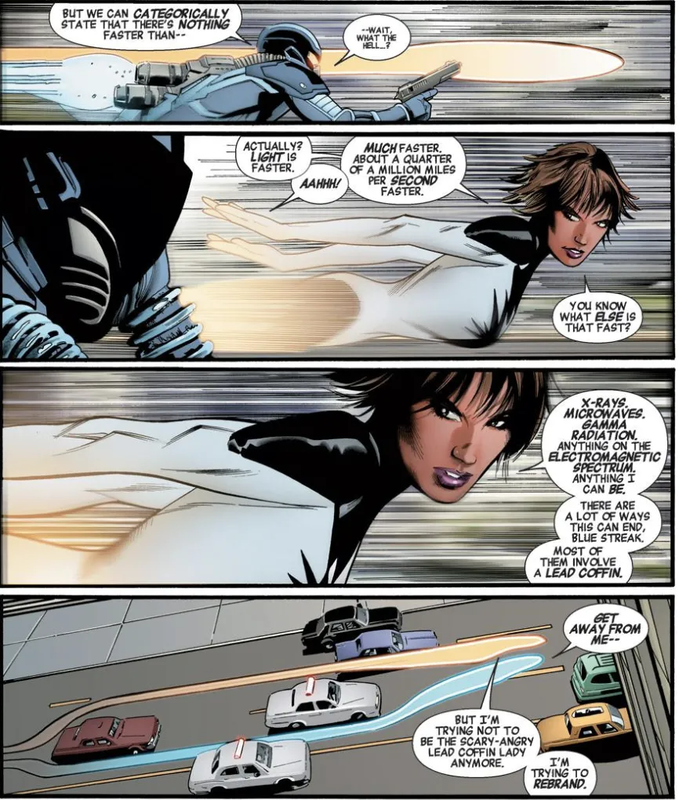 Monica Rambeau in Ultimates No. 11. It appears that Fury’s seemingly offhand comment about Monica learning to “glow” is actually a reference to her awesome powers in the comic books. Of course, she does more than just “glow,” like wielding the power and speed of energies on the electromagnetic spectrum. But there’s one more major tie between Monica and Carol that Captain Marvel doesn’t quite get into: their shared code name. In the world of comic books, code names and titles are important. A code name like Storm or Spider-Man can easily describe someone’s superpowers or abilities. Sometimes it describes a personality, like Wolverine. And then there’s the legacy title — where other characters assume the code name of a hero that they didn’t originate, more recently in play with Captain America and Thor (see: Jane Foster becoming Thor). For the comic book versions of Monica and Carol, the title of Captain Marvel was actually the source of some discontent between the two, and gave them both feelings of impostor syndrome. Monica had the title first, back in that 1982 issue of Amazing Spider-Man, calling and introducing herself as Captain Marvel to fellow heroes. Unbeknownst to her, she had taken the title from a deceased hero. The original “Captain Marvel” is the Kree alien known as Mar-Vell, who, in the comic books and in the movie, was involved in an explosion that granted Carol Danvers her powers. In the movie adaptation, Mar-Vell was gender-swapped and incorporated traits of a woman named Helen Cobb, a female fighter pilot Danvers admires. In these comics, though, Mar-Vell is male — and, back in the day, was also Carol’s main love interest. Or, more specifically, Mar-Vell was the central hero, and Carol was his girlfriend. Mar-Vell’s comic was eventually canceled in 1979 (Captain Marvel No. 62), and his comic book death (The Death of Captain Marvel) happened the same year as Monica’s emergence in 1982. 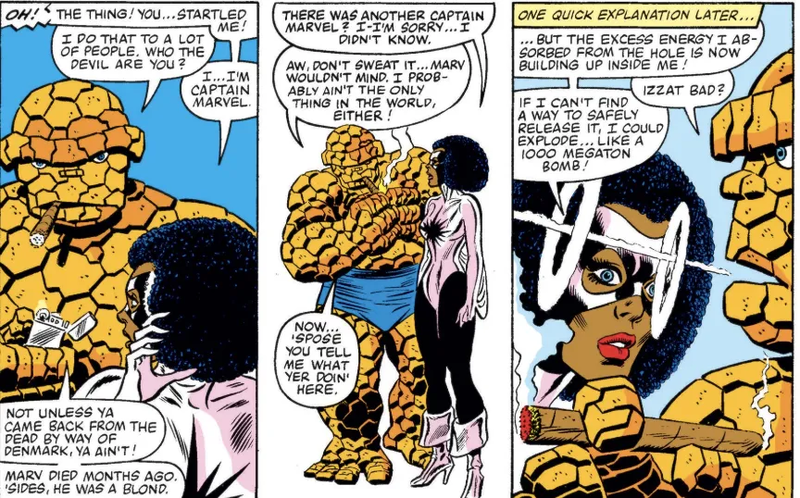 Monica Rambeau and The Thing talk about code names. Carol taking over the Captain Marvel name from Monica is actually a point of contention in the larger context of comic books and representation, primarily because of the lack of visibility for black female superheroes in comic books. Here you have a white female superhero just taking the title from an existing black female character — and one who has a history of losing the Captain Marvel status and getting other, less flagship code names like Pulsar, Photon, and Spectrum in exchange. 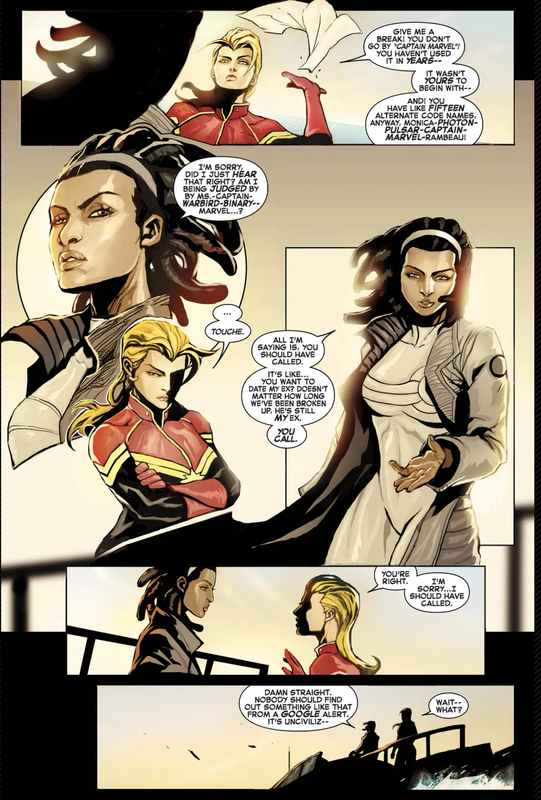 Monica Rambeau and Carol Danvers in Captain Marvel No. 7. By making Monica a child instead of Carol’s peer in Captain Marvel, Marvel eliminated this fight over the title. Monica also isn’t superpowered. But the studio left the door wide open for the future. Here’s why: Captain Marvel takes place in the 1990s, and Monica is a child in 1995. While Carol is out exploring the universe and helping Talos and the Skrulls find a place to live, time has continued on Earth. And when Carol returns in next month’s Endgame, she’s coming back in the year 2018, when the movie takes place — some two decades after she left Earth.